HomeTrust Bank Auto Finance is the newest line of business for HomeTrust Bancshares, Inc. (NASDAQ: HTBI). This indirect lending service is working with auto dealerships in Western North Carolina and the Upstate of South Carolina to provide new and used vehicle financing. On Thursday, March 20th, Kit Cramer, Director, Asheville Chamber of Commerce, and Ben Teague, Executive Director, Economic Development Coalition, joined Dana Stonestreet, Chairman, President and CEO, HomeTrust Bank and Joe McGuire, Director HomeTrust Bank Auto Finance for a ribbon – cutting reception recognizing and celebrating the Bank’s recent new line of business, Auto Finance. 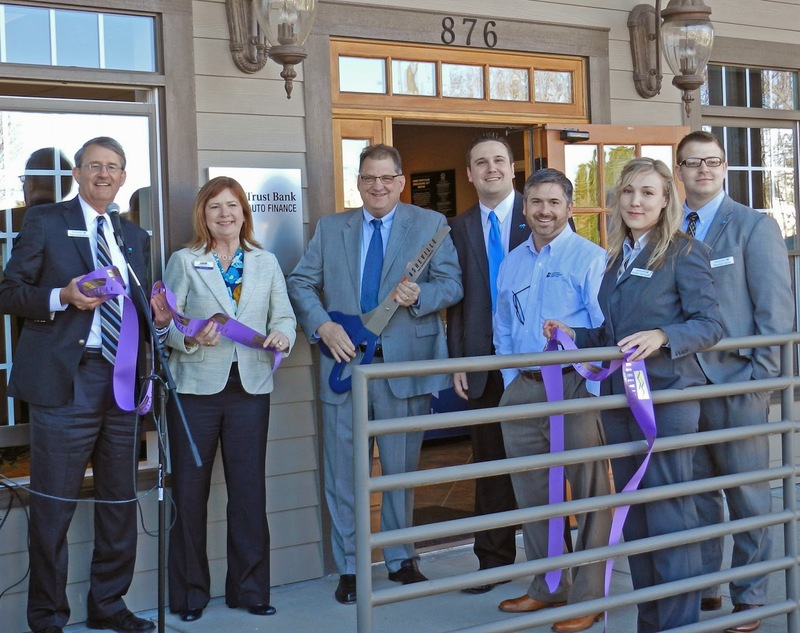 The event was held at HomeTrust Bank’s Indirect Auto Lending administrative offices on Brevard Road. Local auto dealer partners include Forest City Honda, Harmony Motors, Skyland Mazda, Mitsubishi, Chrysler Jeep Dodge Ram, Hyundai of Asheville, Asheville Chevrolet, Coleman Freeman Auto Sales of Hendersonville, Andy Shaw Ford in Sylva and Land Rover of Asheville in Mills River , Lotus of Greenville, S.C., Waynesville Automotive Group, Four Seasons Ford, Hendersonville, Anders Auto Sales, Hendersonville, Hendersonville Chrysler Dodge Jeep Ram, Kevin Whitaker Chevrolet, Greenville, S.C., Boyd Automotive, Hendersonville, Sam + Dave’s Auto Sales, Asheville, Polk Motor Company, Black Mountain, Whitt Motor Sales, Asheville, and Marburger Chrysler Dodge Jeep Ram Nissan of Shelby.